Down the middle of the driveway is a strip of dirt–probably intended to be a strip of grass, but you try growing grass in a space often covered by a car. 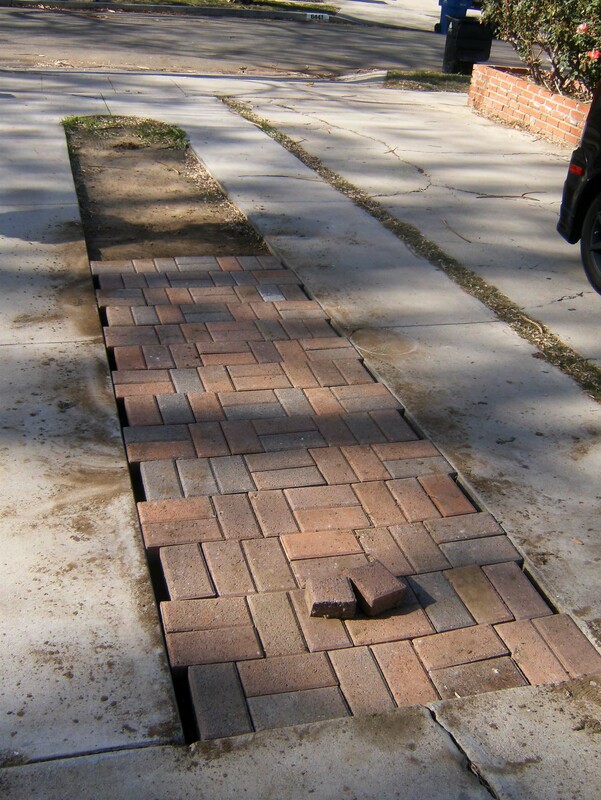 Plus: The driveway is not a solid sheet of concrete, which means that runoff during rainstorms is mitigated. Minus: It’s hard to get groceries out of the back of the car without stomping through the mud. Solution: John has spent several days placing bricks in the space, which should help cut down on the mudbaths. Additionally, since he isn’t mortaring in the bricks, rainwater should still be able to percolate down through the surface to the soil beneath. Also, it looks nice. So where did the bricks come from? Well, that’s another post.